The career of Inti Hernandez started as a member of DUPP Gallery, a young and emerging artists’ collective based in Havana. Founded by Rene Francisco (important Cuban artist and teacher at the Higher Institute of Art, Havana) DUPP was a great learning process for Inti. The initiative combined personal work and collective contributions, inviting the artists to share ideas and engage directly with the social and urban life. The DUPP experience began in 1997 with an expedition to Jaruco in search of the traces that artist Ana Mendieta left in this rocky zone close to Havana. 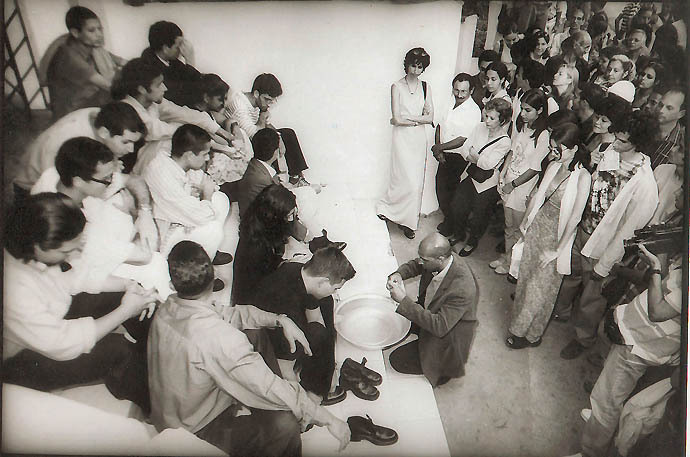 Later, in 1998, DUPP organized the first Festival of Performance in Havana, and the second one in 1999. In the same year DUPP Gallery made two projects in public venues. 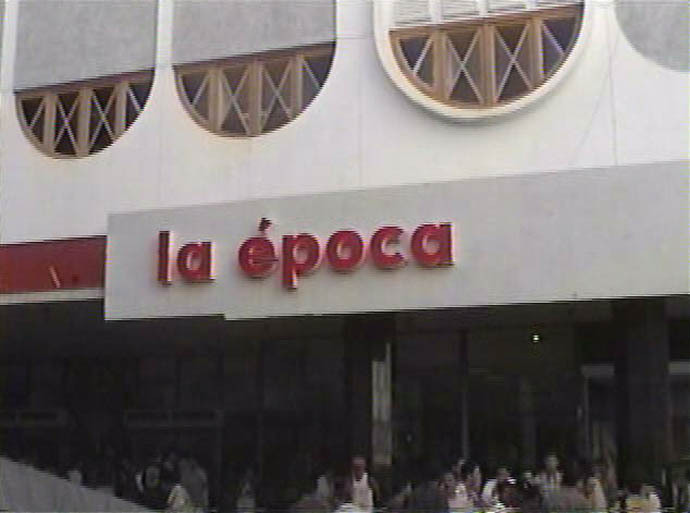 The first project is known as La Epoca and was made inside a department store carrying the same name. In this event the artists inserted their projects in between the products. The art pieces aimed to create conversations with the shoppers passing by. The second project in public space was From an abstract view. This happening was performed at La Rampa, Havana. The action was a sort of tribute to the abstract Cuban artists from the 50’s. DUPP Gallery wanted to stress the potential and the efficacy of an art tuning into other paradigms beyond the traditional Cuban art at times too political and local in its approach. The strong people reactions and their meaningful reflections were overwhelming and a great source of inspiration for the DUPP artists. From an Abstract thought is the first group exhibition of DUPP Gallery inside traditional art venues. Havana Gallery hosted the exhibition. After the action in Prado the inspired DUPP artists wanted to share the conclusion of their experience with the conventional art public. DUPP artists had used their own personal approach to unleash the meaning of the everydayness that Cuban people face. 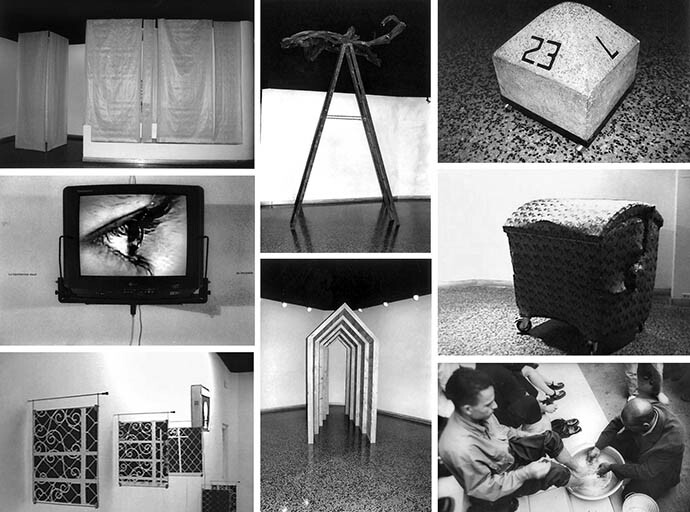 In the year 2000 DUPP Gallery was invited to participate in the VII Havana Biennial. The piece presented, ‘One, two, three, testing…’, was a fulfilment of an artistic research. 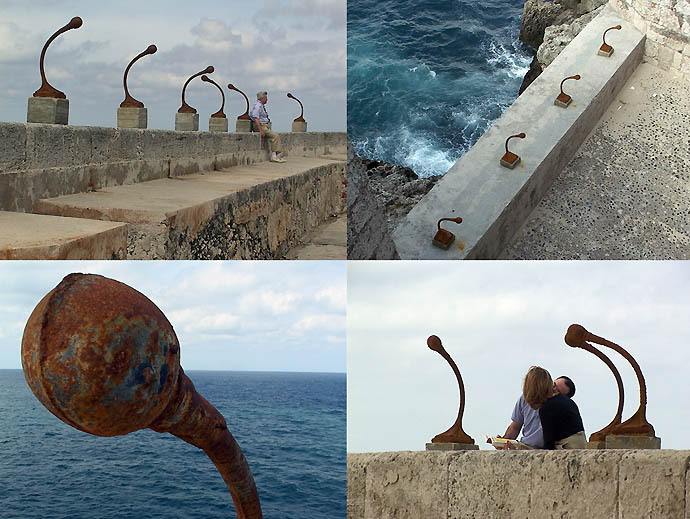 The installation, placed on top of the curtain wall of the Morro Castle consisted of 100 cast iron sculptures with the shape of microphones. Their main statement: to practice art by dealing with universal, more abstract concepts, was challenged by the very use of microphones, a recognizable icon of the Cuban revolution. ‘One, two, three, testing…’ won the 2000 Unesco Prize. With this project DUPP gallery artists learned that inside art all ways most be open and possible. Some times by using a recognizable local icon you reach universal and symbolic meanings that benefit from the grounded strength of the living local icon in use. Beberly Mojena, Yoan Capote, Iván Capote, Inti Hernández, Juan Rivero, David Sardiñas, Omar & Duvier, Ruslán Torres, Alexander Guerra, Mayimbe, Wilfredo Prieto, James Bonachea and Glenda León. 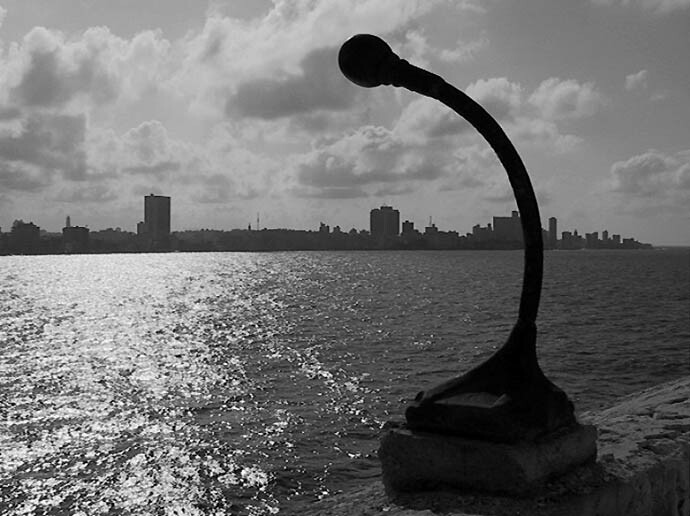 The 2000 UNESCO Prize for the Promotion of the Arts, Seventh Havana Biennial. 1999 La época (Exhibition inside a shopping mall). Havana, Cuba.